The answer to this age old question? To get some Chicken Poop, of course! That might not be 100% accurate since chickens don't technically have lips and therefore cannot slather them with the goodness that is Chicken Poop. Poor chickens! Friends tell me they've seen it all across the country, but Chicken Poop holds a special place in my heart because it's a local Wichita-made product. Jamie's adorable daughter is in Roo's class at school, which makes me even happier to support her mompreneurial efforts. 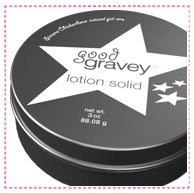 Her line is growing, too: Good Gravey is a solid lotion in a tin (perfect for travel!) and Kill it Dead Natural Defunkifier (So People Think You Take Baths) is a spray deodorant for body, home…anywhere you need to stop stink from growing. There is also a variety of Chicken Poop apparel (think cute tees and headgear) and a new Chicken Poop Outdoors balm. To enter and win a huge pile of Chicken Poop, including a baby doll t-shirt and ten tubes of Chicken Poop (5 original Chicken PooP & 5 Outdoors), plus stickers and samples, please visit Chicken Poop and comment on this post with your favorite finds. Wow so many great things! I also like the good gravy bar! Thank you for the chance to win such a great gift! Wow, gee thanks for hooking me up with a new place to spend my money.. ugh.. lol. I love the Good Gravy lotion.. I must try some right away.. I'm a complete chap stick/lip balm junkie. My husband says the only reason I have chapped lips is because I use chap stick. Hmmph! I would love to try Good Gravy. I think I like Jamies grandpa! What a creative product line. Thanks for the chance. It also made my stomach turn a little...but that's besides the point! I'm fascinated by the lotion solid, and of course the original lip stuff! That dispenser box is super genius! There needs to be a sister brand relating to cow patties so that I can reach my arm up a giant cow and pull out delicious smelling beauty products. Love the names - so creative. I love the gravy lotion and the defunkifier. The t-shirt would be awesome too. Hahahahaha I like the Kiss Me I Have Poop On My Lips sticker. My daughter could put that on her snowboard!!!! I love this stuff! I saw it in a store last year and HAD to have it! I haven't see that Good Gravey yet! That's what I have my eye out for now! I have the tea party button up on my blog too!! This sounds so nice! I'm a lip balm addict so I'd love a chance to win thanks. And on the website my favorite things are the "Limited edition Clear Glycerin Soap" and the "Good Gravey™ Lotion Solid Puck" Since I've never seen anything like that before its really unique! I have the button posted on my review blog. I love all of Angie's Wordful Wednesdays, I participate every week. I like the clear glycerin soap. You are a fav on technorati. I am cutiebootycakes there. I LOVE the bumper sticker "kiss me I have chicken poop on my lips", the tshirts, and the glycerin soap with the tube inside! My family is all in Missouri and my sister just started raising chickens....how appropriate!! What a cute site; it's pink! I'd like to try the good gravey lotion; it sounds great. Leave it to you to find Chicken Poop. love it! I would love to try the good gravy... I have a daughter that needs chicken poop on her lips and the box is too cute! I love the T-Shirt that says " i love chicken poop" its so funny. i luv a good chapstick, especially one called chicken poop! i also subscribed to you via feeder! Seriously, I love the clear glycerin soap with the chicken poop inside. That would be hilarious! I just love the description of the chicken poop lip balm. (So People Think You Take Baths). I like the Chicken Poop in the Clear Glycerin Soap. Another reason to wash up daily! What a creative company! I would love to try the chicken poop chapstick and the good gravy lotion puck. Came over from Angie's blog, by the way. The Clear Glycerin Soap looks really cool. For myself I'd like to try the Kill it Dead. But the chicken poop inside the bar of soap would be a great stocking stuffer! I'm going to try the Clear Glycerin Soap, I just love that! Good stocking stuffers too. I'm a subscriber via email, thanks! “I know how to fix those dry lips, I’ll rub some chicken poop on ‘em so you won’t be lickin’ ‘em.” Brilliant, don’t you think? cute mother's day post from Angie's blog! I love vintage things also! This is really different, and although I'm not sure I'd put chicken poop on my lips (is that vegetarian?) this company is very creative. I like the idea of suspending a lip balm in a bar of glycerin soap--two products in one! Love the name, very creative! And I'd love to get my boys a fleece "Got Poop" beanie - too cute!! 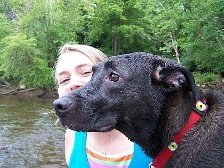 Thanks for the chance to win some poop! Best giveaway yet!! I like the Kill It Dead and the fact that a percentage of the profits go to the Kirk Rundstrum Cancer Fund. I like the Good Gravey Lotion Solid Puck. Tea party button on my contest blog! I need/want/gotta have the lotion. I am a beauty junkie. I have never tried the chicken poop. I will now that I know the story. I love the story. Hilarious and inspiring all at once. oh geesh I think I am almost tearing up. I'd like to try Chicken Poop. I like the limited edition clear glycerin soap and the chicken poop stocking cap. I think the classic chicken poop lip balm will always be my favorite. The good gravy bar looks interesting too. I love names that make me giggle! The Clear Glycerin Soap with chicken poop inside would be a fun gift for the person who has everything. Natural Defunkifier. What neat products! Coming over from Dandelion Wishes! I would love to get the Good Gravy puck! Looks perfect for the cold weather that drys out skin! How funny! I'd love to try Good Gravy & of course the origional Chicken Poop! I love the names!!!! So yucky and funny and cutesy! Gotta have some chicken poop for my lips! What a gag gift item! Love the natural ingredients! Love lip balms anyways! I like the Kill It Dead t-shirt and Good Gravey lotion solid. 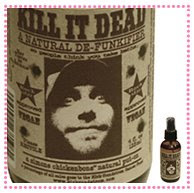 The Kill it Dead™ Natural Defunkifier deodorant sounds interesting. I would love to try some chicken poop and the GoodGravey™ Lotion Solid Puck. This is such a fun site! I love the ear wrap that says got poop. I like the chicken poop in the bar soap. THe display "chicken" that holds the poop is HIGHLARIOUS! I like the Kill It Dead anti-funk spray, but I *love* the Kill It Dead t-shirt! I like the chicken poop outdoors. The Kill it Dead™ Natural Defunkifier is my favorite. I do like it when people think I've bathed. I cracked up laughing at the "Got Poop?" beanie! I desperately need the good gravey solid lotion. My hands are raggedy and dry. Kill it dead is needed here. I love this site! Would love to win these for stocking stuffers. My favorite product, besides the lip balms, is the Good Gravey Lotion solid puck. This sounds like a wonderful product. Hubs wants a chicken coop. I don't b/c of the poop! Maybe he'd settle for these instead! I love the dispenser! Ha ha ha! love the "got poop" beanie. Hahaha love the Chicken Poop clear soap!! Good Gravey Lotion Solid Puck looks interesting! Thanks! Good gravy lotion is my favorite! Lotion Solid Puck. Thank you! Love it all.. I so want a tshirt! I love the defunkifier...i can think of someone right now that could use that! I live in Wichita and have been wanting to try some Chicken Poop. Really unique. 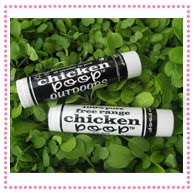 what fun - the chicken poop lip balm would make a perfect stocking stuffer! Chicken Poop lip balm would make novel stocking stuffer presents. I like the chicken poop inside the soap. That should raise some eybrows when people use the bathroom sink. i like clear glycerin soap too! I work from home, so the Kill It Dead deodorant would be perfect so I could fool people into thinking I shower regularly. My choice would be the Original Chicken Poop T-Shirt. Who wouldn't want to smear chicken poop on their lips? Go Grandpa! Thanks for the giveaway. The Good Gravye Lotion Puck looks... intersting. haha. My wife loves the Good Gravy lotion. I love it all but if I could chooase just one it would be, Chicken Poop™ Outdoors and Chicken Poop™ Lip Junk Combo. I enjoyed the story behind why it is called chicken poop - soudns liek soemthign my grandpa woudl say. I'd love to win a pile! the good gravy lotion look great! would love to try it! Lotion Solid Puck would be my choice! Good Gravey Lotion Solid Puck looks intriguing!!! Okay, so what does it say about me that I'm drawn to the chicken dispenser? I'd also really love to try the Good Gravey Lotion Solid Puck. Sounds both folksy and decadent. I have your tea party button on my blog sidebar! I'm dying to try the Good Gravy lotion! The sticker that says 'Kiss Me. I've got Chicken Poop on my lips" is funny! This stuff is hilarious. I really like the good gravy lotion bar. I also like the sticker that says "Kiss me I've got chicken poop on my lips". Thanks for the giveaway! Great names, great products! I'd love the good gravy bar! I like the got poop beanine! how funny. I think I Need some good gravy lotion!! I love the names of everything! My 9 year old son would get a huge kick out of the Fleece Beanie!!! LOL!!! Fun name... very, um.... interesting? LOL!!!! Honestly, I love the Kiss Me. I've got Chicken Poop on my Lips! sticker just because I think it would be hilarious to have! Love the beanie hat with "Got Poop?"....LOL! Love the dispenser box. The Good Gravy lotion sounds neat. Kill it Dead really caught my eye! WHat a great company, thanks!! I am desperate to find a lip balm that cures my winter dry lips! i like the good gravy lotion. The good gravy puck looks like a fun product. Can't wait to look for the lip balm in my local Walgreens in MA---we have such dry lips! I like the gravey and the clear glycerin soap. Looks like great products. I'd go for the Good Gravey Lotion Soild Puck - it sounds so awesome! Ha-ha! I just love the names! These are some products I won't soon forget. :) I'd love to try some balm for my dry, dry winter lips. Thanks! I love all of the T-shirts, but especially the original! I collect chickens, so I think it would be hilarious to have some Chicken Poop around the house! Too funny! I love it! I want some Chicken Poop!!! LOL What a fun company. Sure put a smile on my face today! Ok I really look for good stuff for my skin. You know since I am over the 40 year mark and my hands are really showing it so i love the Good Gravey. I want some Chicken Poop!! I'd like to try the Good Gravey body lotion!! Cool products! I like the Chicken Poop in the Clear Glycerin Soap. How funny! What a great site and the products sound/look great too. I'd like to try the 4-Piece Simone Chickenbone™ Collection. I'd try the chicken poop soap too. I L-O-V-E the display packaging of the chicken. So awesome. Love the story about Grandpa and the chicken poop! The name is so funny. I can see myself pulling out some chicken poop and applying it and getting some very strange looks. The kill it dead spray would be perfect for stinky shoes. The Kill It Dead de-funkifier is hilarious and sounds great! 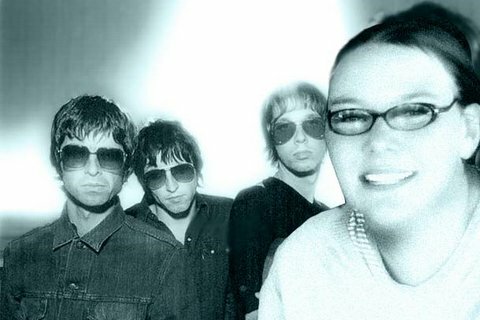 The Good Gravy sounds great! Thanks for the giveaway! The Good Gravey looks good to me! I hve been using Chicken Poop lip junk for awhile-I love it, thanks! I like the original chicken poop t-shirt. I like the Chicken Poop™ Stocking Cap. the Good Gravey Lotion Solid Puck is a great product! Great site! I love the names for their products. I liked the Kill It Dead™ de-funkifier mainly because of the name. Mom used to always say, "they killed him dead" and it brought back great memories. I'd like to try Good Gravey. I like the Kill It Dead and the Good Gravey. Kill It Dead™! These would make awesome gag gifts, but they would actually be useful!